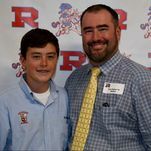 The Annual Archbishop Rummel High School Crawfish Cook-off sponsored by the Ray & Jessica Brandt Family Foundation is a family friendly event held on campus for the purposes of celebrating the Rummel Community and the close of another successful school year. This event invites 35 competing boilers to test their best crawfish recipe against one another voted on by celebrity judges for the rights to be called a Champion Boiler! The Raider Community also gets to enjoy unlimited crawfish and vote for their own best crawfish known as the People’s Champion! Come and enjoy live music, bounce houses, great crawfish and Raider Pride on May 11th 2019.